Norman Rockwell's The Discovery appeared on the cover of The Saturday Evening Post published December 29, 1956. The alternate title for the illustration is Boy Discovering Santa Suit. The original oil on canvas painting, 35.25 x 32.5 inches or 89.5 x 82.5 cm, is currently part of the collection of the Norman Rockwell Museum of Stockbridge Massachusetts. This painting was Rockwell's 293rd overall of 322 total pictures featured on the cover of The Post. Rockwell's career with the Post spanned 47 years, from his first cover illustration, Boy With Baby Carriage in 1916 to his last, Portrait of John F. Kennedy, in 1963. This is also the fifth Rockwell cover in 1956. The Post featured a Rockwell illustration on its cover five times in 1956.
on page 211 of Norman Rockwell, A Definitive Catalogue by Laurie Norton Moffatt. A photograph used in painting this illustration is reproduced in Norman Rockwell: Behind the Camera by Ron Schick on page 179, as well as the painting itself on page 178. The original cover price was only fifteen cents and the original magazine with cover in grest condition sells for up to one hundred dollars. Here is another popular Norman Rockwell Christmas illustration. So, let's first look at this picture from the viewpoint of the little boy. My, what questions must be racing through his mind! He has been digging around in his father's bottom dresser drawer. He has found a box secured with twine. So the next logical step is to open that box. Inside the box, put away for next year, protected by mothballs and hidden from young eyes, is his father's Santa Claus suit. No wonder Santa looked and sounded so familiar. No wonder Santa always knew exactly what was on his Christmas list. Santa had the inside track. What a shock to such a young mind! Now he has to decide how to confront his parents. Wonder if Mother knows about Father's secret identity? The story of the painting's creation is pretty interesting, too. The model was young Scott Ingram. Several days before the modeling session, Rockwell took a pair of flannel pajamas to the Ingram house. The pajamas were several sizes too big for young Scotty. That was all part of the concept. 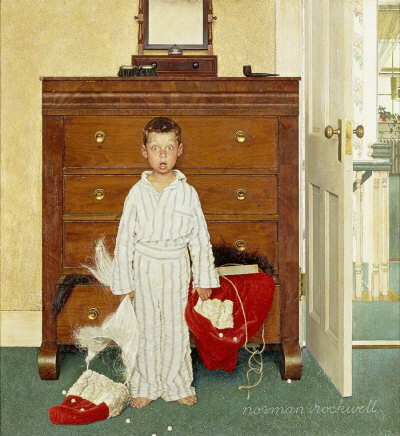 Rockwell told Scotty that he wanted him to wear those pajamas for three straight nights and told Mrs. Ingram not to wash them. He wanted those PJs very wrinkled and slept in. So when it came time for the modeling session, Rockwell told Scotty, dressed in baggy wrinkly flannel pajamas, to act like he had just seen a ghost. Scotty nailed the expression that the artist wanted to see. And that is the painting you see. Norman Rockwell had given us a glimpse into shaking kids' belief in Santa Claus in Santa on the Train. The Discovery was only one of 322 Norman Rockwell Saturday Evening Post covers; Here is the list of Norman Rockwell Saturday Evening Post cover illustrations. In this painting, he shattered some of the kids of the 1950's beliefs in Jolly Old Saint Nicholas. Many parents wrote angry letters to the Saturday Evening Post in response to this painting. It was published four days after Christmas. Santa was still fresh in young minds. I bet there was a lot of bottom drawer digging happening soon after the children of America saw this cover. Rockwell, ever the master of telling a story in one picture, may have told the wrong story to the wrong audience this one time.